Diplay 2 months on your screen, for example ongoing month and next month. Print 2 months on the same page, for example to create a 2018 annual calendar of 6 pages. Click on vignette to diplay the bimonthly calendar 2018. Calendar 2018 bimonthly with detailed agenda, format portrait, a column a month. You will be able to customise the layout of the calendar 2018 (dimensions, colors, alignment, police) via tabs 'Calendar', 'Month' and 'Boxes ' (2). Calendar 2018 virgin bimonthly planning, format landscape, 4 columns. This example of bimonthly calendar 2018 include 4 virgin columns, for example a column for every member of the family, or for every daily activity, or for every instant of the day. To change the number of columns : click on the tab 'Boxes', then on ' Each day ', and choose one, two, three, four or five columns. To change of period (bimonthly or year) : click on the tab 'Templates'. Two months Calendar 2018 to print, tiny horizontal, pocket format, white background. You will be able to customise the layout of the calendar 2018 (dimensions, colors, alignment, police) via tabs 'Calendar', 'Month' and 'Boxes' (2). Calendar to be colored bimonthly, format landscape, for children. To change the picture to be colored, click first on the tab 'Photos ' (5). You can choose a personal picture, a picture to color in another site or picture to color in this site. To see also: All calendars to be colored. Calendar 2018 bimonthly in column with photo in the centre. The new version of calagenda allows the addition of a photograph in the centre of a calendar of two, three, four, five or six monthly calendars in column. It is possible to put a frame around the photo with a color border and a margin (5). To see also: All calendars photos 2018. 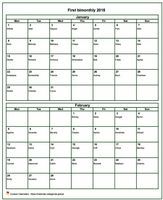 Bimonthly calendar 2018, format landscape, with names. You will be able to customise the layout of the calendar 2018 (size and color of boxes, alignment, police) via tabs 'Calendar', 'Month' and 'Boxes' (2). Bimonthly calendar 2018, format portrait, with names. Decorative calendar to print, bimonthly, format portrait, with photo underneath. A photograph is put underneath the calendar 2018 bimonthly (5) and a legend is diplayed on the top (6). 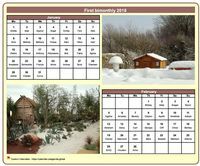 Decorative calendar to print, bimonthly, format landscape, with photo to the right. You will be able to customise the layout of the calendar 2018 (size and colors of boxes, alignment, police) via tabs 'Calendar', 'Month' and 'Boxes' (2). A photograph is put to the right of the calendar 2018 bimonthly (5) and a legend is diplayed on the top (6). 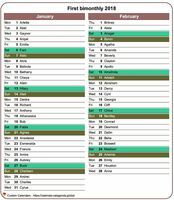 Decorative calendar to print, bimonthly, format landscape, with photo to the left. You will be able to customise the layout of the calendar 2018 (dimensions, colors, alignment, police, borders) via tabs 'Calendar', 'Month' and 'Boxes' (2). A photograph is put to the left of the calendar 2018 bimonthly (5) and it is possible to add a legend (6). Calendar 2018 bimonthly with a different photo every month. To replace photos favourably with family photographs, to click on the tab 'Month ', to choose the month then on click on 'Background'. To change the background color of the 2018 bimonthly calendar, click on the 'Calendar' tab. To display or not display the names of saints in the 2018 bimonthly calendar, click on the 'Data' tab. You can even display two, three, or four saints a day. Each sample 2018 bimonthly calendar proposed above is built from a template. All calendar templates are customizable.